WHAT WE REPAIR MIGHT SURPRISE YOU! Some of the more unusual repairs have been performed by our technician from time to time as well! Over the years we’ve had some unusual requests for paint repairs on a range of household, workplace and industrial items. Try as we might, even with all of our years of experience we can’t always repair everything that comes our way. However, sometimes we even surprise ourselves with what we can repair using our methods as a mobile paint and dent repairer! If we think we can repair it well, utilising our mobile repair skill whilst ensuring a quality finish…….. We’ll give it a go. 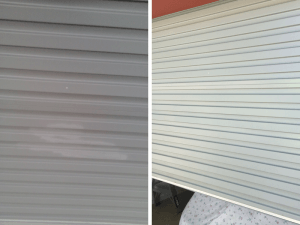 Over the years SMART Paintworx technicians have repaired garage and roller doors, washing machines, pedestals for the State Library, fences, air conditioning units, window frames and more. It’s because we’re mobile and not all objects can be moved that gives us the edge. Specialising in smaller repairs makes us the perfect option. The technician will assess and make sure the repair is blended with the existing paintwork to ensure an undetectable finish. This means not having to respray full items or panels. Remember that limiting the size of the repair area can save valuable time and money! When it comes to paint and dent repairs for objects other than vehicles, it’s worth contacting us to find out what we can do. 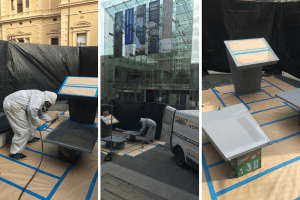 While we can’t undertake all unusual paint repairs, our highly skilled technicians aren’t afraid to try something new or think outside the box to get a job done. If you’ve got an unusual paint repair think SMART and let us see if we can repair it our way. This entry was posted in Unusual Paint Repairs and tagged paint touch ups adelaide, unconventional repairs, unusual paint repairs adelaide. Bookmark the permalink.